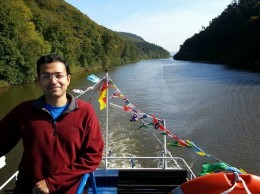 Pramod Anantharam is a Ph.D. student at Wright State’s Ohio Center of Excellence in Knowledge-Enabled Computing (Kno.e.sis). He is currently a visiting doctoral student at the University of Surrey, where Anantharam will soon complete his work on CityPulse, a European Union project in which Wright State is a partner. Pramod Anantharam recognizes the uniqueness of his opportunities. His professors recognize the uniqueness of his potential. “Pramod’s work can have broad implications for applying new technologies—from asthma mitigation to assessing the progression of Parkinson’s disease, from predicting traffic delays to conserving energy,” said Wright State professor T.K. 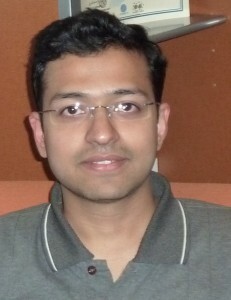 Prasad, Ph.D.
Anantharam is a Ph.D. student at Wright State’s Ohio Center of Excellence in Knowledge-Enabled Computing (Kno.e.sis). He is currently a visiting doctoral student at the University of Surrey, where Anantharam will soon complete his work on CityPulse, a European Union project in which Wright State is a partner. He has also been invited by the University of Debrecen in Hungary to present his research at a faculty seminar. Describing his work in the most basic of terms is difficult, but Anantharam’s specialty is to develop the means to glean helpful nuggets from copious amounts of data. His work on the CityPulse project can be applied directly to health care by collecting health-related events from informal textual streams (such as tweets). Anantharam is also researching the use of low-cost sensors and mobile devices to help understand how to more effectively manage asthma. The same research, however, can also be used to help manage Parkinson’s disease, vehicular traffic, and disaster response. Anantharam will return to Dayton in January, submit his work as a journal publication, and resume his studies and research. A native of Bangalore, India, Anantharam earned bachelor’s and master’s degrees there and worked as a software engineer at Hewlett-Packard before coming to Wright State. During a conference at the University of Madrid, Anantharam presented a tutorial on the Internet of Things. Faculty members from the Hungarian university attended that tutorial and, later, invited Anantharam to speak at their faculty seminar. “He is a good communicator and pleasant to work with, which is a hallmark of a successful team player,” Prasad said.